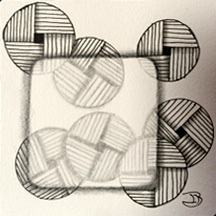 Here we go again – circles and squares. I paired one of my favorite tangles (Chang) with one of my favorite techniques (14 Shades of Gray ala Sonya Yencer of Ohio). I added some 9B graphite and viola! AWESOME! Love how transparent the square is! Thank you! I really like that technique.